The original plan was to ski powder laps below treeline in the Tatoosh -- but a sucker hole and glimpses of the summit through the clouds on the drive up convinced us to go big instead! We ended up with an unexpected, amazing, magical day high on the Mountain: over 5000 vertical ft of all-powder conditions, from 10500 ft on Cowlitz Cleaver above Camp Muir, all the way down to the parking lot at Paradise, not wind-affected or sun-crusted at all. 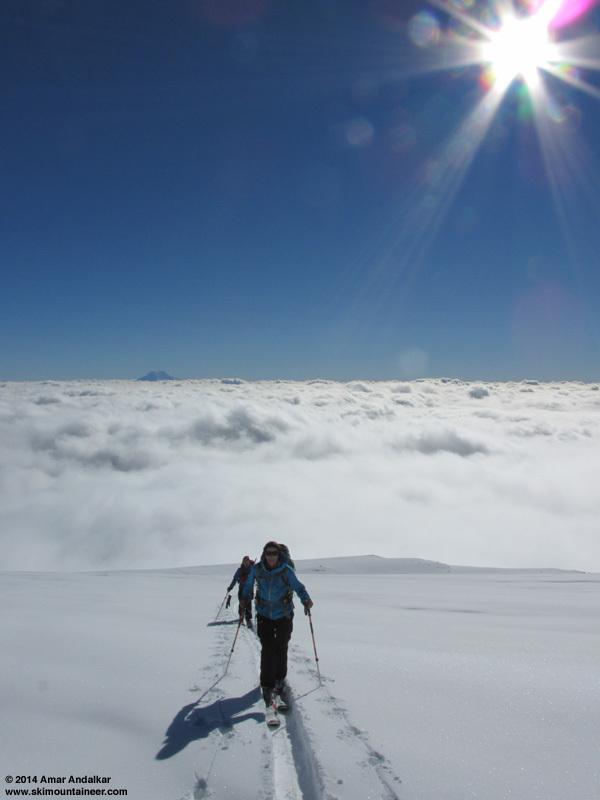 We basked in warm sunshine and calm winds up high above the sea of clouds, T-shirt weather for some of us despite free-air temperatures of only 12 �F at 10000 ft, then even got a full-on snowstorm later in the day as we dropped back down into the cloud deck during our ski descent. Just exceptionally rare to get high-quality powder over such a huge range of elevations, including most of it far above treeline. Perhaps even more exceptionally rare is that all 4 of us had brought ski crampons on a day we planned to ski powder laps, which ended up coming in very handy at a few spots near Panorama Point and on the upper Cowlitz Glacier, after plans changed and we went high. I love it when my ski partners bring proper equipment along in case of such eventualities! 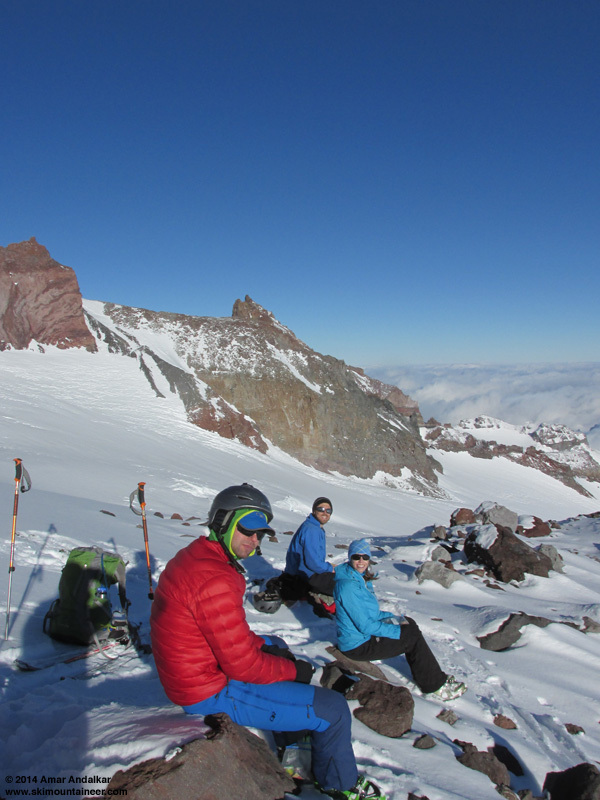 It's shocking to think that less than a week earlier, we'd been skiing the same slopes in summerlike corn conditions (see 7 combined trip reports in Juneuary 16-26, 2014, Rainier, 10K to Bridge CORN!)! And despite how outstanding those corn snow conditions were, these were just as good in a different way -- it's nice to welcome winter back for a while in the Pacific Northwest. Given the 2 ft of new snowfall received at Paradise during the latest storm cycle, I figured that skiing powder laps in the north-facing bowls of the Tatoosh would be a good plan for the first day of February, and Alisa, Mike, and Jeremy agreed to join me. The park road had not opened until after 11am the previous day (Friday) following snow removal operations, so things were probably still untracked almost everywhere. Snow stability was likely to be much better at Paradise than areas near the Cascade passes (especially Stevens and Snoqualmie), which according the NWAC reports had a buried surface-hoar layer topped by the storm snow, and which was very reactive and potentially hazardous. Luckily any such surface hoar that might have existed near Paradise had been completely destroyed by an extended period of heavy rain up to 7000 ft at the start of the storm cycle, so that weak layer was a total non-issue, and the rest of the snowfall had come in very right-side-up, with decreasing temperatures and winds and snow density throughout the latter stages of the storm. Webcam view earlier that morning from Paradise, showing glimpses of the upper mountain similar to what we saw on the drive up. 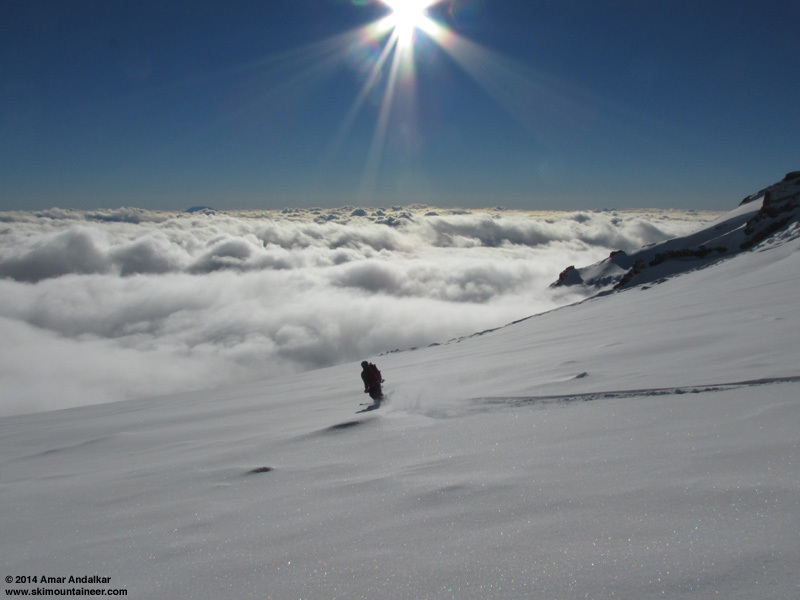 The forecast for February 1 looked marginal for going high, partly sunny and a chance of snow showers with free-air temps of 12 �F and winds W 15 mph at 10000 ft. 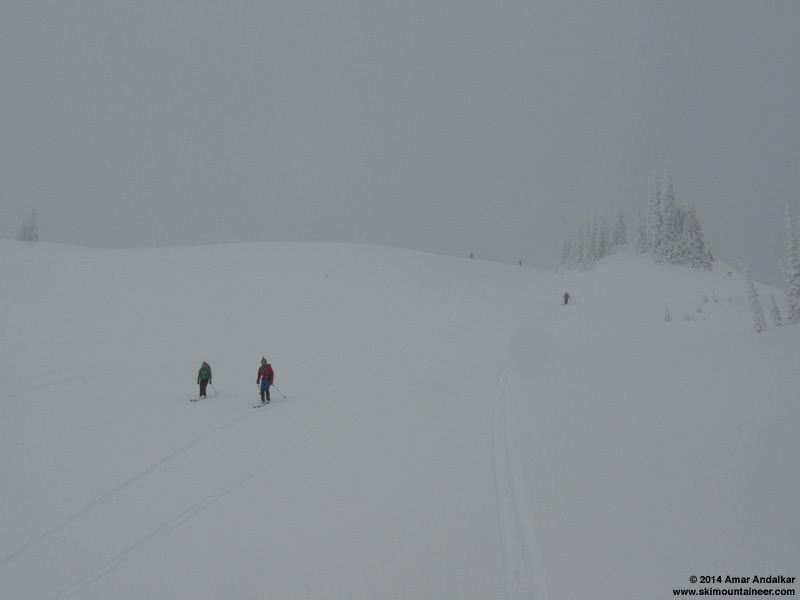 But the thought of skiing Muir and Nisqually Chute in powder conditions was on our minds during the drive from Seattle, if the weather would allow it, especially given that telemetry showed that the last portion of the new snowfall had fallen with very light winds. The Mountain was visible at times along the drive, fueling the idea. We passed through the Longmire gate just after it opened at 9am, and caught a few glimpses of the summit and upper slopes through breaks in the clouds, which convinced us to drop the Tatoosh plan and aim high. Skinned up from the middle of the Paradise parking lot (about 1" of compact snow left atop the pavement from the plowing operations) just after 10am, under mostly cloudy skies with just an occasional brief glimpse of sunlit slopes far above. 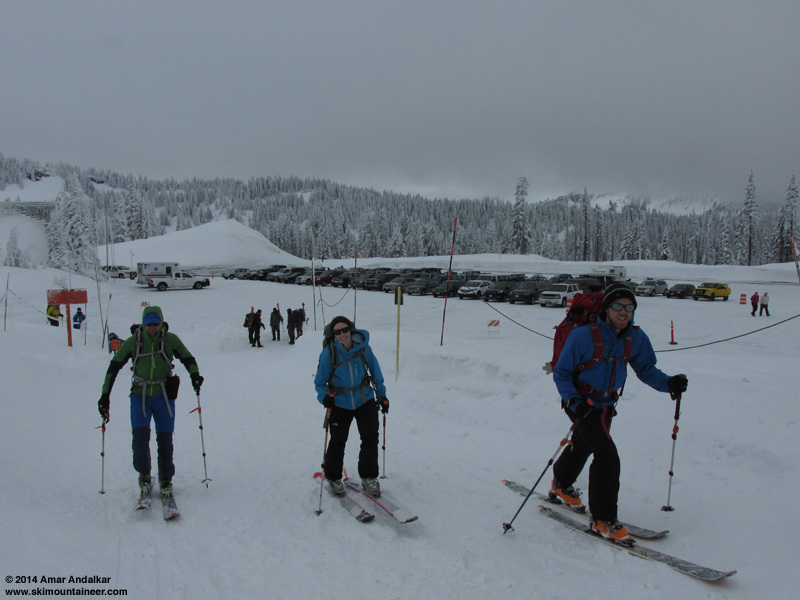 We negotiated a cluster of skiers and snowshoers and others at Panorama Point, strangely enough all were initially following (and some mangling) a skin track that other skiers had put in up the preferred south side of the SW ridge of Pan Point (perhaps the previous day? 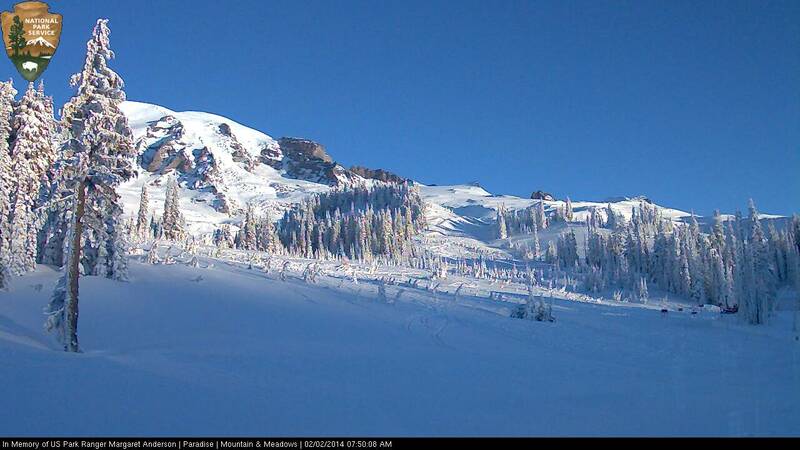 ), while Pan Face still remained completely untracked this morning at 11am. After an unpleasant interaction and some unfortunate words with a particularly worrisome-looking snowshoer and his skier partner, I decided to avoid the conflict and put in my own fresh track up Pan Face instead and rejoin the SW ridge higher up. Would spend the next hour or so breaking a separate skin track as far away from them as possible on the route to avoid any further user-group conflict. A couple of firm sections on the rolls near 7000 ft made ski crampons very helpful, but not quite essential. By 7500 ft, we were almost above the cloud deck, but it was slowly rising throughout the morning and so any hesitation on our part seemed to allow the clouds to gain on us. The snow along the winter route at these elevations had a topping of a few millimeters of rimed snow, and the ongoing rime was frosting our hats and hair as we skinned. Finally busted out above the clouds into the warm sunshine at noon, just over 7500 ft, to be greeted by the completely untracked expanse of the Muir Snowfield, gleaming white with fresh smooth powder. 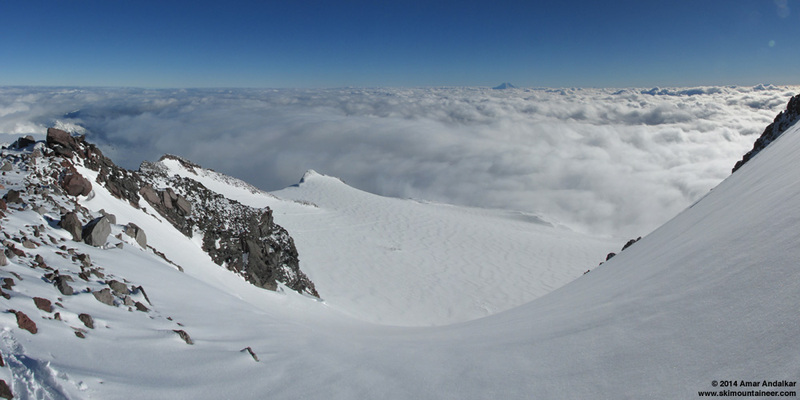 Two-shot panorama of the completely untracked Muir Snowfield just after we broke out above the cloud deck. The clouds threatened to catch up to us a couple more times, but soon we were well in the clear. I broke trail along the more direct route (with less sidehill and less steep and less travelled) a bit west of the standard handrail-route along the rocks at the east side of the Muir Snowfield. 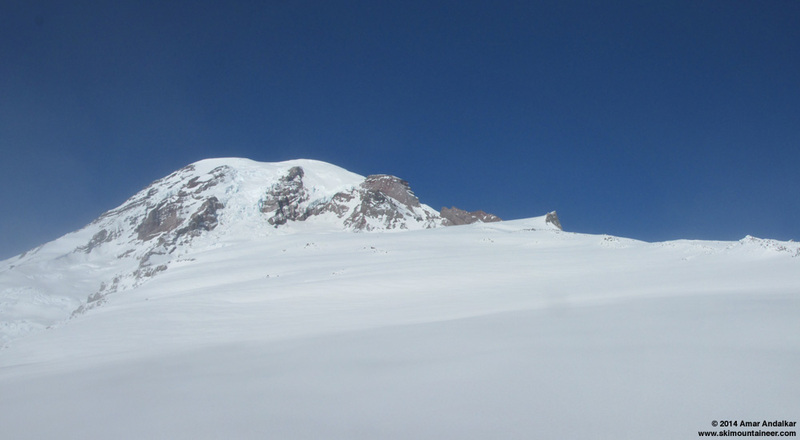 We would be all alone on this side of the Snowfield for the next 2 hours until approaching Camp Muir. The trailbreaking was fun and fairly easy in the 8-16" of right-side-up powder (ski penetration mostly 4-6"), and I was enjoying being out in front. But by around 8500 ft, I was clearly tiring, and it was time to unleash my main man Marshawn McCarthy to take over trail breaking and go Beast Mode up the Mountain. Just glorious sunny warm weather above the sea of clouds, almost calm with only a hint of occasional breeze. Much nicer than expected from the forecast. 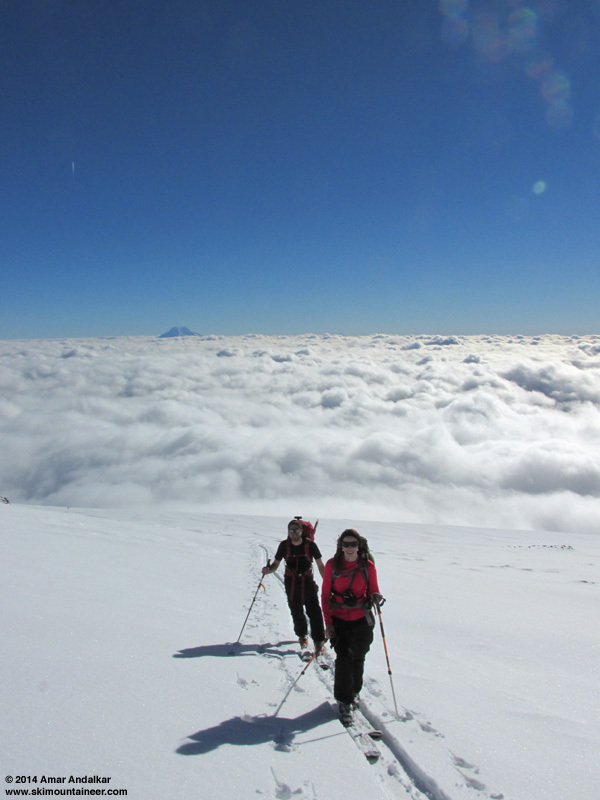 Mount Adams rising above the cloud deck from the Muir Snowfield. Our pace quickened behind Marshawn's relentless rushing attack, and soon the goal line drew near. Two-shot panorama of Marshawn pushing the pace up the completely untracked Muir Snowfield. After a brief standing discussion at Camp Muir, we decided to go for the two-point conversion and head up a bit higher via the edge of Cowlitz Glacier (minimal crevasse hazard at this time), to the nice flat spot at 10500 ft on Cowlitz Cleaver above Camp Muir. 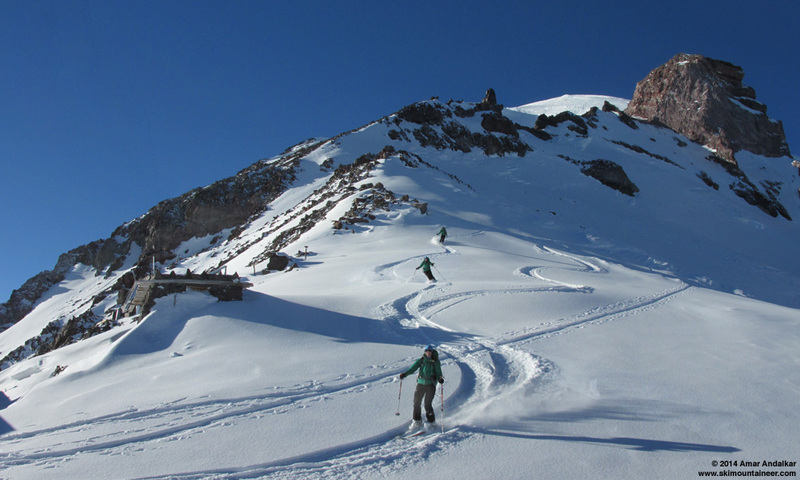 This provides the option of skiing either the sunny south-facing AAA Gully down onto the Muir Snowfield or the protected east-facing slopes of the edge of Cowlitz Glacier, which this day held 4-6" of truly light, dry powder atop a firm base. In a few spots on the Cowlitz the base was firmer and the powder atop it thinner, making skinning somewhat slick on the 30-degree sidehill, and ski crampons were once again very helpful but not essential. As soon as we passed into the shade, the reality of the 12 �F free-air temperatures hit us and it was quite chilly until we broke out into the sun again a bit higher up. Topped out at 10500 ft around 2:45pm, and enjoyed a nice sunny break and snack and changeover in totally calm conditions. Then it was time to ski at 3:15pm, Mike opting for the sunny slopes of AAA Gully and the rest of us choosing the powder-on-crust of the upper Cowlitz. I've skied AAA Gully several times before, so I decided to go for the guaranteed blower pow which we had just skinned up, rather than the uncertain snow of the gully. 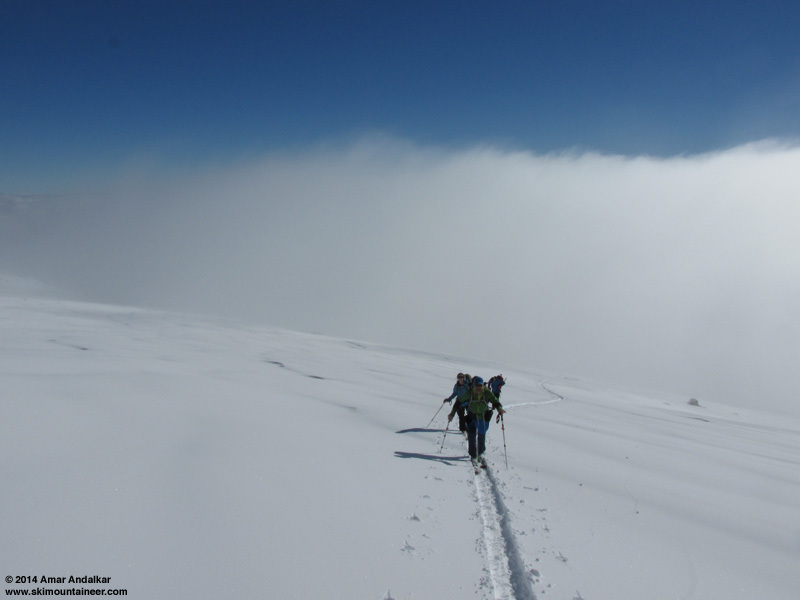 Sweet turns on the Cowlitz back to Camp Muir, although the snow was too light to keep us fully above the crust. 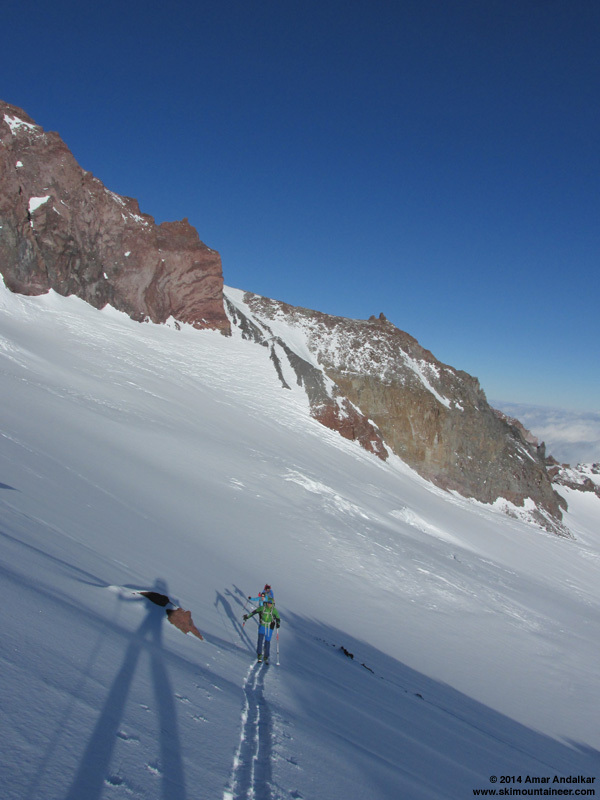 The powder was still great on the lower-angle, south-facing slopes below Camp Muir, the winter sun being too low and weak to affect it at these elevations even after 3 straight days of sun up here. AAA Gully was more variable as expected, having gotten a bit more wind, and much more sun due to its steeper slope angle, but still had good snow. 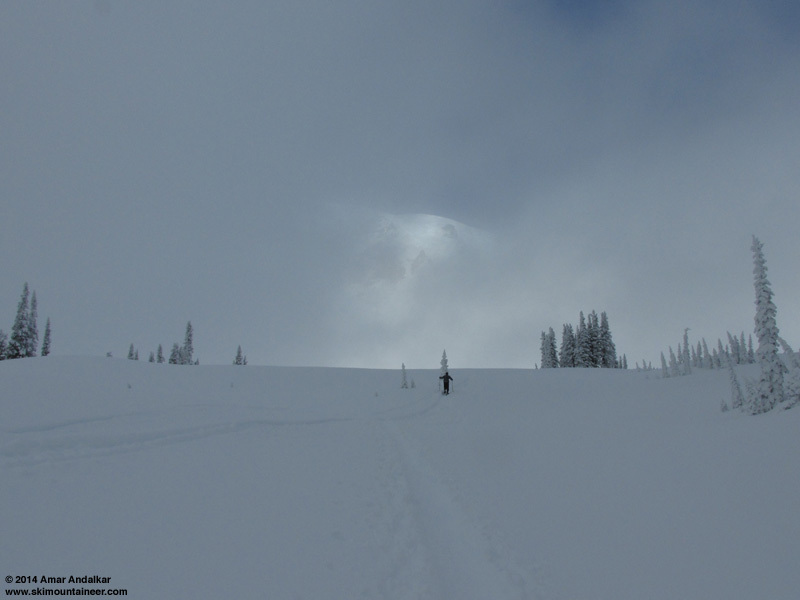 We discussed whether we should try to ski Nisqually Chute, either all the way down to the bridge like we were considering on the drive up (which would risk unknown difficulty in hitching a ride), or just the Chute and then skin back out to Glacier Vista. But given the whiteout conditions we were certain to encounter back down in the clouds, we all agreed that it was best not to try that this day. 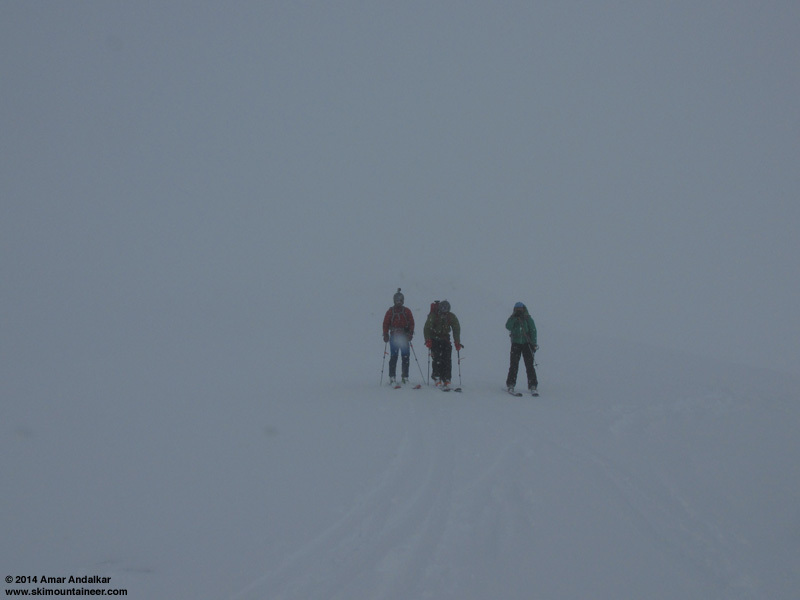 Then it was down into the cloud deck below 8500 ft, a disorienting whiteout at times, made easier because a few skiers had beat us to the descent and made first tracks down here, providing welcome contrast and definition to the snow. Snow quality remained excellent. A bit of rime ice from the fog crusted our goggles, but not too badly to see. Below 7700 ft the wind increased from calm to W 15-20 mph, bringing with it wind-driven snow, quite hard at times -- pretty much a full-blown snowstorm. 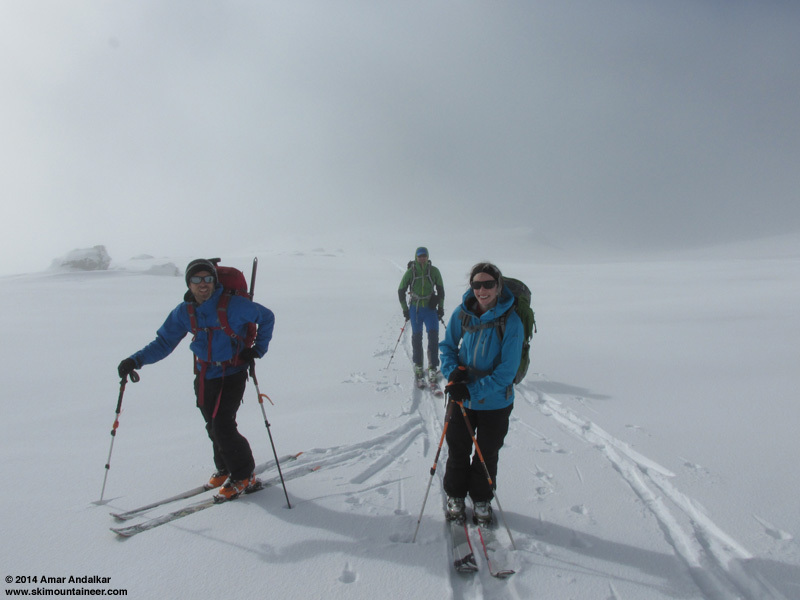 Negotiating the more featureless aspects along the traverse from 7500-7000 ft was the toughest skiing of the day, the snow still powder, but hiding the numerous rocks, and the wind-driven snowfall stinging our faces. Things got better again along Pan Point and the slopes below, less wind and still good powder, especially skiing just off to the side of the stampede path. And more powder all the way back to the typical winter-carnival scene at the Paradise parking lot, just after 4pm. What an outstanding day with exceptional snow conditions, great partners, and mostly fine weather, 5100 vert of truly memorable powder turns in a single glorious run. SYNOPSIS...NORTHWESTERLY FLOW ALOFT OVER WESTERN WASHINGTON THROUGH SUNDAY. AN UPPER TROUGH WILL MOVE THROUGH THE AREA SUNDAY NIGHT INTO MONDAY. THIS SYSTEM WILL BRING A CHANCE OF SNOW SHOWERS TO THE PARK. COLDER TEMPERATURES AND MOSTLY DRY WEATHER WILL PREVAIL TUESDAY THROUGH THE END OF THE WEEK. SATURDAY...PARTLY SUNNY. A CHANCE OF SNOW SHOWERS IN THE MORNING. NO SNOW ACCUMULATION. SNOW LEVEL AT THE SURFACE. SATURDAY NIGHT...MOSTLY CLOUDY. FREEZING LEVEL NEAR 2500 FEET. SUNDAY...PARTLY SUNNY. A CHANCE OF SNOW SHOWERS IN THE AFTERNOON. SNOW LEVEL AT THE SURFACE. SUNDAY NIGHT AND MONDAY...MOSTLY CLOUDY WITH A CHANCE OF SNOW SHOWERS. SNOW LEVEL AT THE SURFACE. MONDAY NIGHT...MOSTLY CLOUDY WITH A CHANCE OF SNOW SHOWERS. SNOW LEVEL AT THE SURFACE. TUESDAY...PARTLY SUNNY. FREEZING LEVEL AT THE SURFACE. TUESDAY NIGHT...MOSTLY CLOUDY. FREEZING LEVEL AT THE SURFACE. WEDNESDAY...MOSTLY CLOUDY. FREEZING LEVEL AT THE SURFACE. WEDNESDAY NIGHT...MOSTLY CLOUDY. FREEZING LEVEL AT THE SURFACE. THURSDAY...BREEZY. PARTLY SUNNY. FREEZING LEVEL AT THE SURFACE. THURSDAY NIGHT...MOSTLY CLOUDY. FREEZING LEVEL AT THE SURFACE. FRIDAY...MOSTLY CLOUDY. FREEZING LEVEL AT THE SURFACE. 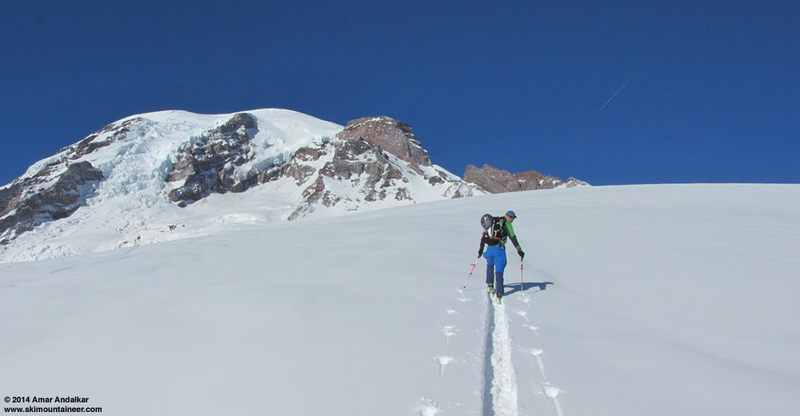 So how do you get top-to-bottom powder conditions over a huge range of over 5000 vertical ft from Paradise to above Camp Muir (and probably well over 7000 ft, from below Nisqually Bridge at 3900 ft up to over 11000 ft at the top of Cowlitz Glacier)? The answers are in the telemetry data below. The 2 weeks of sunny high pressure and almost no precip ended early on January 28, with light precip at first with a snow level above 7000 ft. Much heavier precip arrived that evening, at similar high snow levels, and then snow levels plummeted after a cold front passed through on the morning of January 29, initially to 5000 ft and eventually below 2000 ft overnight, producing 10" new snow at Paradise by the morning of January 30. This first batch of snow had about 10% or higher density, and fell with moderate-to-strong winds aloft (winds at Paradise unknown due to long-term wind speed outage). But then the magic occurred: heavy post-frontal showers in strong W-NW flow dumped another 13" new at Paradise by Friday morning, January 31, at similar low snow levels and with winds aloft decreasing sharply throughout the snowfall, producing a snow density of only 5-6% (0.72" precip / 13" snow from noon Jan 30 to 9am Jan 31) -- pretty close to blower pow by Northwest standards. 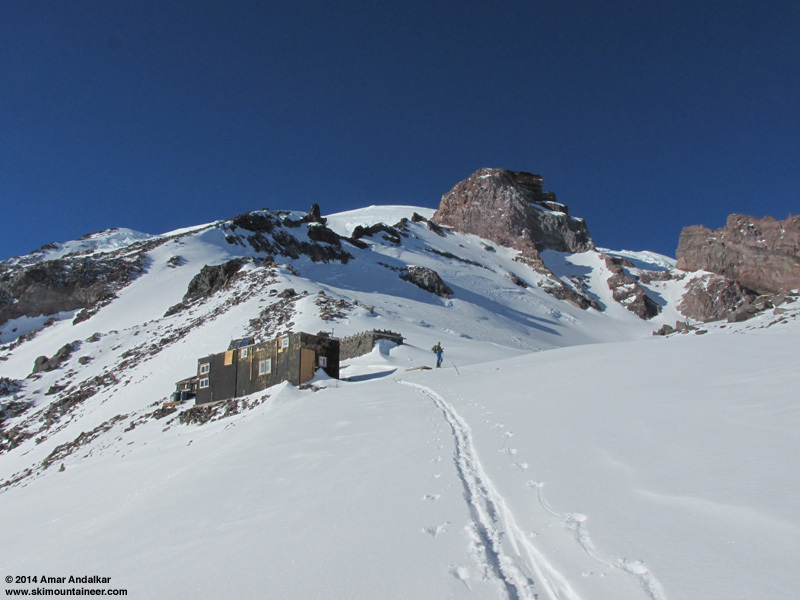 Solar data shows that Camp Muir was mostly above the clouds from Jan 30 onward, as the strong post-frontal flow was largely confined to lower elevations (as is typical), thus elevations above about 9500 ft ended up with only 4-6" of very light powder atop the windpack formed earlier in the warmer and windier periods of the storm. New powder depths on most of the Muir Snowfield from 7500-9500 ft were generally about 8-16". The clouds took over again at Paradise by late-morning for the rest of Superbowl Sunday, while Muir once again basked in the sunshine above the clouds all day. Nice choice. 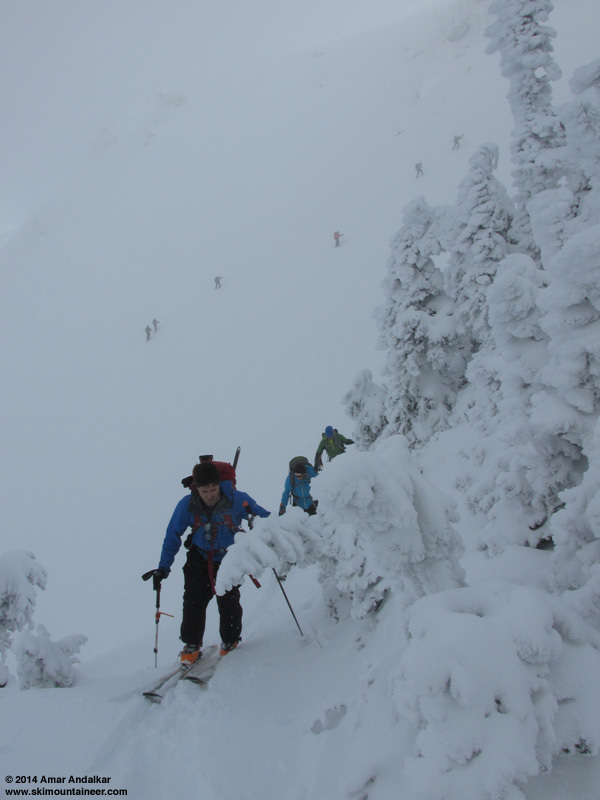 The pow in the Tatoosh was deeper and fluffier on Saturday, but you still made a wonderful choice for a Sunday ski. You have to admit this is so much better than corn. The girls are not in halter tops and shorts, but I will take this anyday over even the best corn. We chose Rainier for the same reason we had this belief the rain would make stuff more stable and that was quite true. One person kicked off a slide on Foss Peak but if you stayed off the prominences where the wind blew there was decent stability for steeper lines on the more open slopes. I hope you did not miss any of the big game that was crazy. Hawks ruled. Keep cranking those turns!! 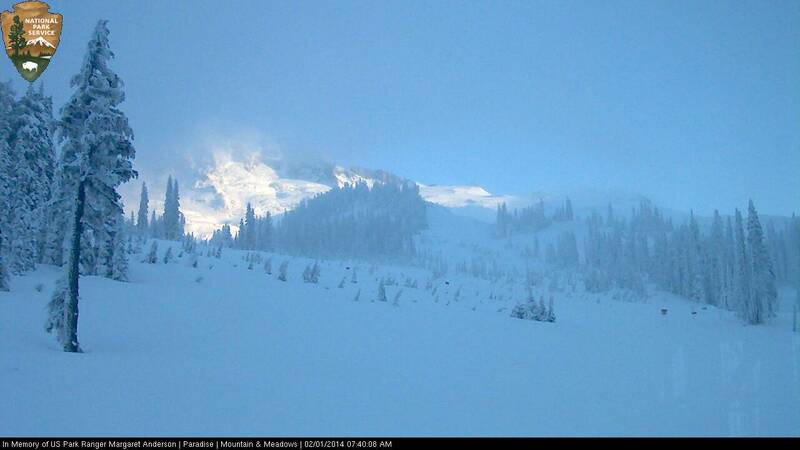 Nice choice.� The pow in the Tatoosh was deeper and fluffier on Saturday, but you still made a wonderful choice for a Sunday ski.� ... I hope you did not miss any of the big game that was crazy.� Hawks ruled.� Keep cranking those turns!! Um, this was on Saturday, February 1. Too tired to do a Sunday ski trip, so I did watch the entire game, one of the best Super Bowls I've ever seen despite the lack of last-second thrills. What a great looking day!